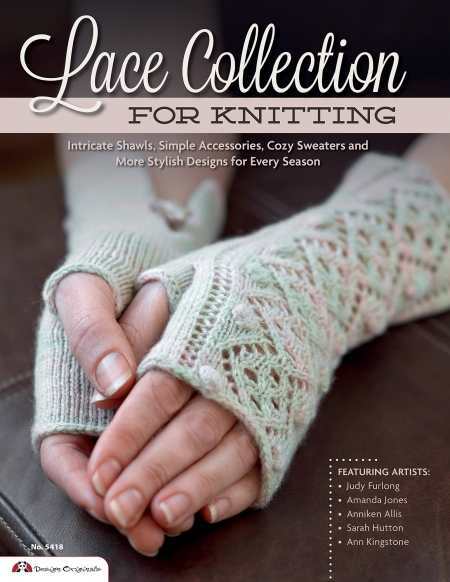 The twenty­-three stunning patterns in Lace Collection for Knitting will make any wearer feel as though she’s on the runway every day, whether adorned in a fitted sweater, an elegant cardigan, or a flowing shawl. The front cover does not do justice to the interior art—gorgeous photographs of models exhibiting the clothing and accessories give the book a sleek and chic fashion magazine feel. Even without the intent to pick up the knitting needles, turning the pages of this book offers an exquisite visual experience. Starting with tools and suggested yarn, each designer gives row-­by-­row directions for knitting these enchanting and dainty pieces, including the entwined cockleshell, leaf, and ruffle details. Both written instructions and charted schematics are included, and both are equally clear and easy to follow by intermediate to advanced knitters. A list of knitting abbreviations at the front of the book is a helpful addition.